The Omni Massage Roller provides a stimulating, deep tissue massage, anywhere, anytime. Use this portable massager on any part of your own body or share it with a friend. Designed for professional and home users, The Omni Roller has been tested and approved by Chiropractors, Massage Therapists, Physical Therapists and Sports Trainers nationwide. Cleans Easily! For light clean up simply spray with a mild household cleaner and wipe dry. For heavier buildups of massage oils and creams, soak inn warm soapy water and rinse clean. Allow to drain and towel dry. GlidePoint Massager: we used to offer a brand like this called the GlidePoint Massager. It had a handle and looked a little different. The Glidepoint is no longer available to us. Roll Away the Aches and Pains Associated with Stress and Tension! 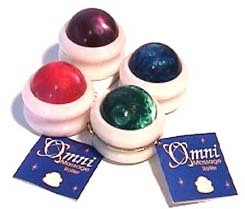 Order your Omni Massage Roller Today! Mouse over picture for alternate view.